I'll let you in on a secret: I've never seen any of the other Fast and the Furious movies. But here's another secret: you don't have to have seen ANY of the movies in the series to enjoy Fast and the Furious 6. It's got fast cars, action, and some eye candy to boot, for both men and women - what more do you need in a summer blockbuster? I've been told that in the other movies, Luke (Dwayne Johnson, aka The Rock) had been chasing Dominic Toretto (Vin Diesel) and his gang. 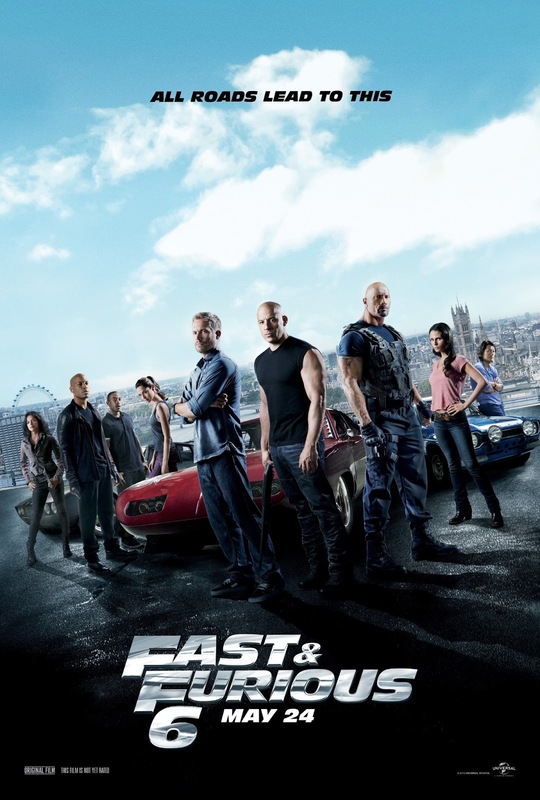 In this movie, however, Luke and Toretto team up to take down the bad guy, Owen Shaw (Luke Evans), in exchange for full pardons for Toretto and his friends. Toretto is also looking for his former girlfriend Letty (Michelle Rodriguez), who was supposed to have died while undercover in a previous movie, working for cop Brian O'Conner (Paul Walker), now a part of Toretto's team, but recently photos of her had surfaced; turns out (SEMI-SPOILER) she had lost her memory, and has no recollection of Toretto or his friends - oh, and she's also working for the bad guy (Shaw) now, too. Toretto and his team must take down Shaw and try to rescue Letty in the process, all while retrieving a special computer chip that Shaw has in his possession, as well. The dialogue was a little cheesy at some points in this movie, but let's be honest: we're not here for the plot. The action in this movie was fantastic, if unbelievable: Cars flip across highways (and in the air), tanks come out of trucks, there's plenty of street racing, and yet the actors come out with barely a few scratches. Yes, see this film. It might be a "fluff" popcorn movie, but it's a highly entertaining one, and after Iron Man 3, it's the next summer blockbuster that should do very well at the box office. I should probably watch some of the older movies at some point to catch up on the series, but what I liked about this one was that it did provide a little bit of backstory - the audience can figure out that Letty used to be Toretto's girlfriend, and that he and his team have done a lot of "jobs" together - they reminded me a bit of the Ocean's 11 team in that respect, although they weren't robbing banks/casinos. Make sure to stay to see an extra scene in the middle of the credits that sets up Fast Seven nicely, too. Fast and the Furious 6 is in theaters today, May 24th, and is rated PG-13 with a runtime of 130 minutes. 4 stars out of 5.